BBC NEWS | UK | Magazine | Are we subjects or citizens? Are we subjects or citizens? Home Secretary Charles Clarke has floated the idea of citizenship ceremonies for 18-year-olds. But are British people subjects or citizens? The short answer is that we are probably both - a very British compromise - but it needs some explaining. A subject is someone "under the dominion of a monarch", says the Oxford English Dictionary. The subject has no say in how they are treated - although there is an excellent sketch in Monty Python and the Holy Grail on the merits of revolutionary government among the peasantry. A citizen however is someone who does have rights. In ancient Greece and Rome that meant some citizens took part in government. So, in short, a subject does what he is told - but a citizen has the right to be heard. It was in the centuries following the Norman Conquest of 1066 that things really started to change in the British Isles. 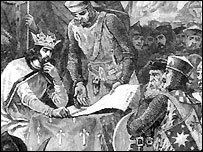 In 1215 King John signed the Magna Carta. It was essentially a "code of conduct" for how a monarch should treat barons. But it also conceded the principle that the King's power was not absolute. 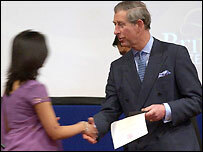 This was the first time that the concept of the rights of an individual appears in British law. Over the next 800 years, Britain slowly developed these ideas. One very early development was Habeas Corpus - the right not to be detained without good reason. As European philosophers increasingly questioned the nature of authority, more and more power was ceded to Parliament by the Monarchy: Indeed the English Civil War and the French Revolution came down to an argument over the power of the monarch. In the last 150 years, ordinary people themselves finally got a proper say in the UK, culminating with universal suffrage of men and women by 1928 (only women over 30 got the vote in 1918). Each and every one of these steps created more rights for the people and more duties upon rulers - the fundamental shift from subject to citizen. That transfer of power is not however absolute: the unwritten "social contract" declares that society only functions if citizens agree to be subject to the law made in their name - in other words we give up our right to be absolutely free in return for the protection that society provides. Here's the tricky bit for the UK: When you search for the piece of paper explaining exactly when we stopped being subjects and became citizens, you won't find it, although admittedly passports now use the word citizens (thank you to the correspondents who have pointed this out). Part of the reason for this confusion is that that our constitution is not neatly contained in a single form like other states. Nationality laws introduced the word citizen during the break-up of the British Empire - but only as a means to differentiate UK residents from other British subjects for immigration purposes. But if you do look what you find is a history of rights and duties flowing from Parliament, in the name of the Monarch, which create the concept of citizenship. And it is the role of the courts in protecting these rights and duties as citizens, rather than just enforcing the state's will, that is key to the idea of modern citizenship. Take the 1998 Human Rights Act for example, which enforces a European-level convention: If your child cannot get a place at any school anywhere within in reasonable distance of your home, a judge may well decide the local council has breached little Johnny's right to an education. In other words, a public authority must consider how their decisions affect you, the citizen. If that effect is damaging without good reason, then it shouldn't do it in the first place. Today, the government talk is very much of "rights and responsibilities" within citizenship. Children get taught it, naturalized immigrants formally celebrate it. Home Secretaries make speeches on it and even employ lots of people to think about how to create it. All leading politicians generally agree that citizenship is in the interests of a strong society - they just squabble over government's role in achieving it. So while we are legally "subjects" because there isn't a single piece of paper that says otherwise, the sweep of history essentially finds that we are citizens, albeit in constitutionally different ways to other nations. Whether I like it or not, I am a subject not a citizen. I look to an improbable scenario in which I and the Queen are trapped in a bunker, having survived a nuclear holocaust. If the Queen were to insist that she had the last tin of Spam all to herself, then as her subject, I would be committing treason if I disobeyed. However, I doubt whether she would be that unreasonable and I get my share. Does that make me a citizen, or just a belligerent subject? I have no trouble seeing myself as a subject of Her Majesty the Queen, especially as I still favour the monarchy over any alternative forms of rule. However, I am very glad to be able not only to vote for a government, but also to have freedom of speech. Without a constitution we merely have the liberty to do anything that is not proscribed by law and, in theory at least, we only have the right to do it until the Monarch/Government decree otherwise. This is good because I can do anything that is not against the law but bad because without a constitution there is no guarantee that this will always be the case. But I don't live in a city. Can I have a villagership ceremony, instead? Am I not a citizen of the European Union, irrespective of what the now obsolete British Crown may think? Since our Sovereign no longer has sovereignty how can I be a subject? Although British people are citizens in practice, being referred to as a subject is just a way of preserving the country's unique cultural identity. The citizens of the UK should do what ever it takes within reason to maintain their national identity. There are a significant number of long-term foreign residents (myself included) who would quite like to become British citizens - but who refuse to swear subjection to any monarch! You say there isn't a single piece of paper that says we're citizens - but doesn't the British Nationality Act 1981 make us citizens? Where does the idea come from that citizens and subjects are mutually exclusive? If people can be citizens of London and subjects of the Queen at the same time, why cannot they be citizens of the UK and subjects at the same time? Either way, so long as people have pride in the country one way or another, then it's all good. The fact that politicians and members of the armed forces (among others) must swear allegiance to the Queen and not actually to the country speaks volumes for the argument that we are subjects, not citizens. I welcome the idea of still being a subject. The beauty of British democracy is the inherent right of the individual under the Monarch, which is why monarchy has survived. The Monarch should be the universal symbol that all British people can rally to and share cultural truths of identity and national unity. If former East Germany could laughably call itself a "Democratic Republic", I am more than happy to be labelled a mere subject. Regardless of the vestigial power the monarchy has, the balance of power lies de facto with Parliament and the people. Any failure to secure better rights and freedoms for ourselves these days lies entirely at our own door. I am a citizen in whatever matters I am related to a democratic government. But I am a subject in the sense that the government is still Her Majesty's - and hence subject (for me hopefully) to her last word. With ID cards we shall revert back to being subjects again because we will have to justify our very right to be here. Being citizens via the 'sweep of history' does not protect us from the power of parliament to make any law it sees fit, as there is no UK constitution and no checks and balances to guard against their whim. We are legally British subjects but that is overwritten by our being European citizens. The Human Rights Act's purpose in the enforcement of European law is the dimension neglected in the article. One of the reasons the British Monarchy is so good is because of Oliver Cromwell. The day will pass when we are able to govern ourselves, in real democracy as opposed to being governed by so called "representatives". Neither subject nor citizen! If it means not having to do stupid and pointless citizenship ceremonies then I'm quite happy to remain a subject. Citizenship in the Roman Empire meant one who was free from slavery and knew the laws of the land. With more and more decisions taken by a small minority of modern day Roman senators, and the decision-making closed from the everyday person, I do not believe that we would fulfil the criterion of ancient citizenship: a hands-on approach to our law. Charles Clarke is eleven years too late. Under the 1994 Maastricht treaty we all became 'citizens' of the European Union. God save José Manuel Barroso [president of the European Commission]. I am a citizen of my country and a subject of my Sovereign. God forbid I am ever a subject of a politician. A written constitution does not guarantee our status but it does make it a good deal harder for our rights and freedoms to be eroded and for that reason I support the idea. As a descendant of English/Scotch immigrants who came to America in the 18th century, I find it interesting that your rights are seen as flowing from Parliament. Our Founding Fathers (all good Englishman) put forth our rights as coming from God and not man. Therefore the fundamental rights of Americans are 'unalienable' and cannot be restricted by government because they are seen as God-granted.